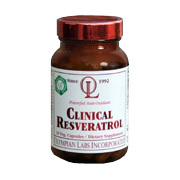 Resveratrol is a naturally occurring phytoalexin. Phytoalexins are chemical substances produced by plants as a defense against environmental stresses and infection by pathogenic microorganisms, such as fungi. Studies suggest that resveratrol demonstrates potent antioxidant activity and may be associated with a reduced risk of abnormal cell growth. Resveratrol may also be cardioprotective due to its ability to inhibit the oxidation of low-density lipoproteins (LDL) and inhibit platelet aggregation. Clinical Resveratrol Extra Strength 500mg is shipped in a discrete, unmarked package. Orders are processed immediately and usually take about 3 to 5 working days to be received. We do ask that you try it for 2 to 3 weeks to feel the full effects. Any information received is used only for order processing and shipping purposes. Your information, such as e-mail address, will never be disclosed to a third party.